It often seemed to me that we were a luxuriously equipped expedition going forth to seek discomfort…But discomfort, after all, is what the camper-out is unconsciously seeking. This essay in the Smithsonian magazine takes a look back at the road trips of self proclaimed Vagabonds Henry Ford, Thomas Edison, John Burroughs and Harvey Firestone. 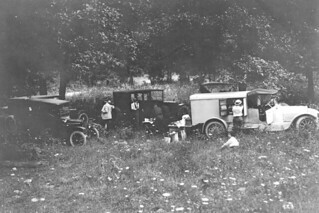 What starts as a summer camping vacation turned into an annual road trip between 1915 and 1924 as the four friends explored America by car. John Burroughs described the group as “joy riders with a luxurious outfit calculated to be proof against any form of discomfort” when he wrote about their 1918 in trip in A Strenuous Holiday. Burroughs was a naturalist and nature writer who was active in conservation. Initially opposed to the automobile, he became friends with Ford and joined the annual road trip. A Strenuous Holiday appears in Under the Maples, a collection published the year that Burroughs died. A short read at only 17 pages, Burroughs (then in his 80s) paints an idyllic picture of the road trip as it travels through Pennsylvania and West Virginia, before heading south. There is something charming about his account, from the little girl with a bucket of apples to his descriptions of titans of industry at play; whether it be Henry Ford challenging people to races, Thomas Edison’s unkempt appearance, ‘delicious humour’ and his ability to turn vagabond “very easily”, or sitting around the campfire listening to Edison discussing chemistry or Ford discussing mechanics. discomfort, after all, is what the camper-out is unconsciously seeking. We grow weary of our luxuries and conveniences. We react against our complex civilization, and long to get back for a time to first principles. We cheerfully endure wet, cold, smoke, mosquitoes, black flies, and sleepless nights, just to touch naked reality once more. It is after he gets home that a meditative man really makes such a trip. All the unpleasant features are strained out or transformed. In retrospect it is all enjoyable, even the discomforts.